I’m honored to have been asked to be a judge at this year’s National Cornbread Festival in South Pittsburg, Tennessee! If you’re planning on coming to this fun event, be sure and RSVP on my Facebook page by clicking here so I can keep you updated on my whereabouts because I’d love to get to meet you! Christmas and New Years behind us, and most folks are in the middle of winter, snuggling within their quilts and homes, cooking up stews and cobblers. Oh I’m doing the cooking part but not the rest of it, my mind is on other things. You see, soon as January hits, I get to expecting spring. I can’t help it, it is my absolute most favorite time of year for a number of reasons but one in particular – I get to see my daffodils. Now before you go to thinking that I’m looking pretty far off you gotta understand that daffodils are usually in bloom here by February and the first sign of yellow, my heart up and declares SPRING! I go by my own time table with the seasons, I’m just a wild woman that way. When we moved here to Bountiful a few years back, I was delighted to find a well thought out and beautifully planted ring of spring flowers around each tree in our front yard. Tete a tete daffodils, crocus, and hyacinth came up in unison, presenting the perfect blend of spring colors and fragrance. It really warmed my heart to walk around those trees, kneeling by them and lovingly taking in the flowers, knowing that someone had once cared so dearly for this house. So that very first fall, I ordered more bulbs. King Alfred, tete a tete, orange throat, every variety I could find (and afford). I ordered around a hundred that year and got out with my little shovel and planted each and every one of them myself. The following spring the beautiful flower rings around my trees were joined by others out and about in the yard. I had planted them as my mother advised, randomly, with no set pattern so they just popped up in the yard like little surprise blooms of sunshine. They were absolutely breathtaking and I dearly love those few weeks of looking out my window and seeing the happy little flowers waving back at me in the breeze. A few months back I was in Lowe’s and walked by a bag of 100 more bulbs. They hopped in my buggy and came home with me where Katy Rose and I went about planting them, wherever she felt we needed them to be. My goal is to eventually have an entire yard filled with daffodils for a few weeks out of each year. They’ll slowly spread from the road right up to my front doorstep . After a few decades of this, and with my kids moving out and more cats coming to live with me (isn’t that the natural evolution of things?) no doubt people will start to talk. I’ll begin wearing a hat with a giant silk daffodil in it and trade in my preferred red shoes for daffodil yellow ones to match. Folks will start calling me the Crazy Daffodil Lady as I walk around town in my finest daffodil yellow regalia. But hey, I can think of worst things to be called. By then I’ll have so many that I can make large bouquets and deliver them to nursing homes and other spots around town that need brightening and then come back home to a yard still filled to the brim. We all gotta have dreams. If you’ll excuse me, I found some daffodil bulbs at Wal Mart yesterday and I think I’ll plant a few before the sun goes down. I know that technically this isn’t the time of year to plant daffodils but I like to live life outside the lines. Heck, I even wear my watch on my right hand, even though I’m right handed and my engagement ring is on my finger first, THEN my wedding band (I’ve gotten more emails on this than I can count). You see, at the end of the day, I’m just a rebel to the core. Oh yeah, I even eat raw cake batter. I do shocking things like that…and I plant daffodil bulbs in December. While I am still pretending to be partially sane, let me bring you a casserole today. There are so many variations on this casserole that you could throw a rock at the internet and hit fifty on any given day. This is mine, it’s pretty easy and awfully good. Modify it, play with it, make it your own. Just let me know what time it is served and try to have plenty of tea when I show up, please 🙂 Or Diet Dr Pepper…Diet Dr pepper is always good, too! 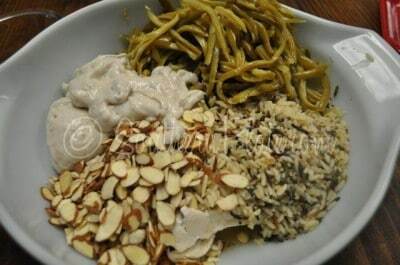 You’ll need: Long Grain and Wild Rice (with seasoning, such as Uncle Ben’s), Cream of Mushroom Soup (can use fat free), French Style Green Beans, Chicken, almonds, and Ritz crackers and a wee bit of butter to pour over the top, which isn’t pictured. If you don’t like Cream of mushroom soup, just use Cream of chicken, cream of celery, or cream of whatever-cranks-your-tractor. You can also use fat free or low fat or i-don’t-wanna-get-fat, if you can find it :). For those of us already there, just go with the recipe because it tastes so good :). 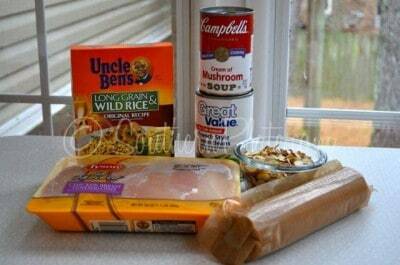 Nowadays Uncle Ben’s make quick cooking long grain and wild rice as well as the traditional featured here. Use whichever you pick up first. The almonds are optional but I gotta tell you, I love what they do to this dish! NOTE: You can also add a cup of sour cream to this and it will be wonderful! This is completely optional, but I love it. I’m not including it in this tutorial but I will list it as optional in the recipe below. Note: Normally I wouldn’t have used chicken tenders for this because they are a little more expensive. This is a great recipe to use cooked chicken leg quarters (deboned and shredded), leftover chicken, or a whole fryer (cooked, deboned, and shredded) in, but since I did have this chicken on hand and company was a coming (did I mention I like to make this for company) that is what I used. 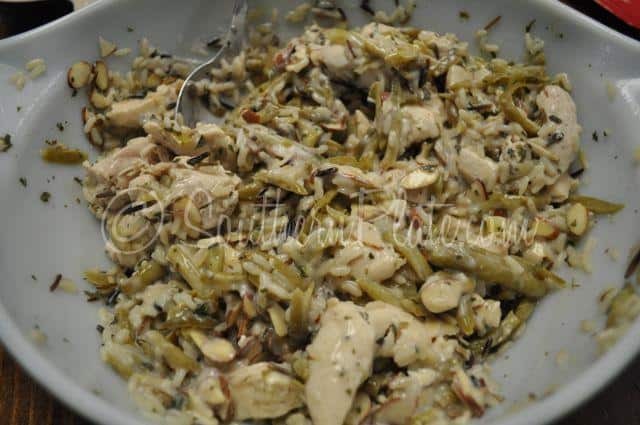 Dump chicken, cooked rice, green beans, cream soup, and almonds into a big old bowl. Give it all a stir until it is good and mixed. Spray baking dish lightly with non stick cooking spray. 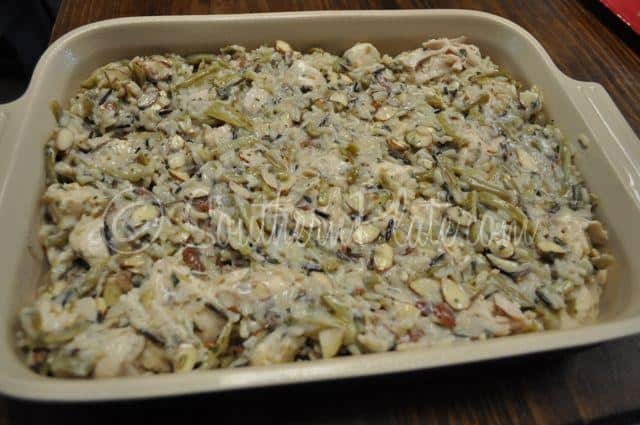 Spoon casserole filling into baking dish. Sprinkle crushed crackers all over top. Drizzle melted butter over the cracker crumb topping. Place everything except topping ingredients in a large bowl. Stir until well combined. 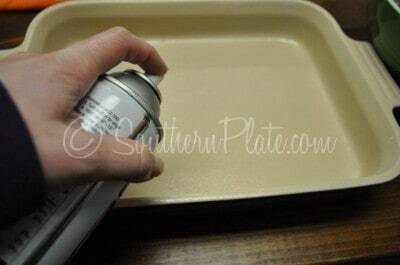 Spoon into greased 9x13 baking dish. 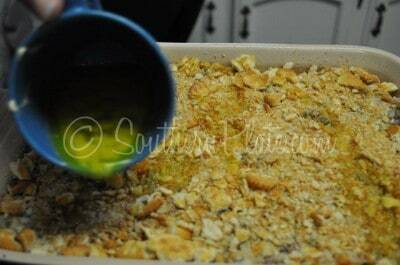 Top with cracker crumbs and drizzle melted butter over. 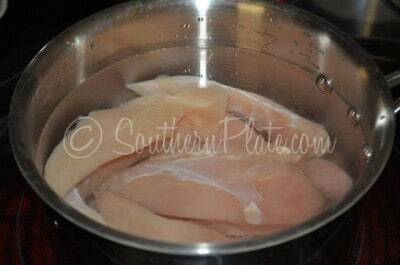 Football Showdown Recipes and Tips from Southern Plate! I like your goal! I once gave someone with a spring birthday 200 cut daffodils ( this was in the day when you could buy them 12 in a bunch for less than a dollar at your local grocer), in a pail — once they all opened, it was the most glorious display! It still makes me happy to think of it. OH MY GOODNESS!!! I Can’t imagine a pot of gold being a better gift! What a give you are, Gail!!!! Not only do I love your goal but the recipe sounds great! My husband really like’s Uncle Ben’s Wild Rice so that will be what I use for this and for just two I half it, or better yet freeze half of it for another meal. I love your thinking Karen!!! My daffodils are starting to come up here in Alabama, they should be blooming in a couple of weeks. WOOHOO!!! Mine won’t be far behind. I always have daffodils for my birthday! This sounds great, but can you use brown rice? I am not a fan of wild rice. Oh my goodness! I am from N. FL. and the moment the New Year rings in, I want to plant my garden!! Last year, I had to plant twice because a late freeze killed my precious, early garden! I’m with you… love the snuggles, but can’t wait for spring! Christy, I couldn’t find the usual “Print recipe” at the bottom of the directions. I didn’t want to print everything, just the recipe. Can you add that under the recipe like it usually is? I love all your recipes. I’ve lost count how many I’ve used over the holidays. just did! I’m bad about forgetting that but it’s there now! Haven’t printed one of your recipes in a while (generally I just scribble them down because I’m so busy), but wanted to print this one. What happened to the print option you used to have? I’m at work, and due to firewalls, I can’t download the Google Recipe View Microformatting thingy, so I’m dead in the water for having this one printed for my recipe file. Boo-hooo! Sounds great, though, and I’m definitely going to scribble this one down and will try it this week! GRR!!! I Forgot to put in the print codes. Thanks for reminding me! They’re in there now!! love the new quote at the end of this one!!!! Just a little behind you Christy in NC mine will be blooming by March! Anyway after Christmas to me winter is just blah….Waiting on spring too! Christy~Right there with you! I have already planted morning glory seeds inside and have some gorgeous primroses as well…. I am going to have to try this one tonight !! : ) It looks great !! Christy, The email I read right before yours was from a friend of mine and we were discussing our trip to TN for the Cornbread Festival. The 4 of us enjoy going all over to “food festivals”. Cornbread being one of my top 5 favorite foods, we are just going to HAVE to go to that one next. :o) Now, I’m completely thrilled that I will get to see you there. Although I am obscenely jealous that you are going to be a taste tester/judge for some of the best cornbread in the world. J.E.A.L.O.U.S!!! See you there!! When is the cornbread festival? Last year’s date is still on their website. I really need to plan some daffodils this summer, my tulips will be coming up in the first part of April. Only 2 more months of cold and spring will be here. I am more than ready. There is one tiny little crocus under our holly tree in the front yard and every March I start looking for it, when I see it, it makes me so happy! You can’t beat a good chicken and rice casserole! I hope I remember to attend the Cornbread Festival! Daffodils are my favorite and I look forward to seeing them every year. They were my great grandfather’s favorite as well it makes me think of him I am sure he has his own garden full of them in heaven. : ) I can’t wait until they begin to bloom in Kimberly, Alabama !!! Imagine my shock when I moved into a 100-year-old house in an historic neighborhood in the fall and found out the following spring that there were no flowers! Silly me, I just assumed every responsible, self-respecting homeowner had at least a few daffodils around the front porch! Nope – the only non-tree ornamentation in my yard was four flowering yucca plants (you know, the kind that look like a seven-foot-tall stalk of flowery asparagus) and a more-than-half-dead honeysuckle. I surely remedied that the following year, let me tell you! Oh, and I will eat anything you put in front of me that has wild rice in it! Looks tasty! *an awesome crazy daffodil lady I meant. Hi Christy! You make me SOOO jealous! I live in MI where spring doesn’t come (at least for daffodills) until mid April if we are lucky. 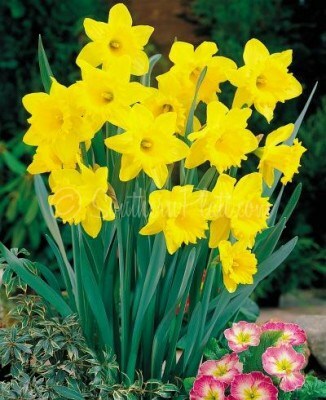 OMG, I would give anything to see my daffs come up this early! LOVE, LOVE, LOVE this recipe! My mom used to make something like this out of her leftover chicken and leftover rice. Sure brings back the memories. Thanks so much-going to have it for supper tomorrow when all my kids come home from work. *laugh* Sounds good to me! Gotta love one-dish meals. 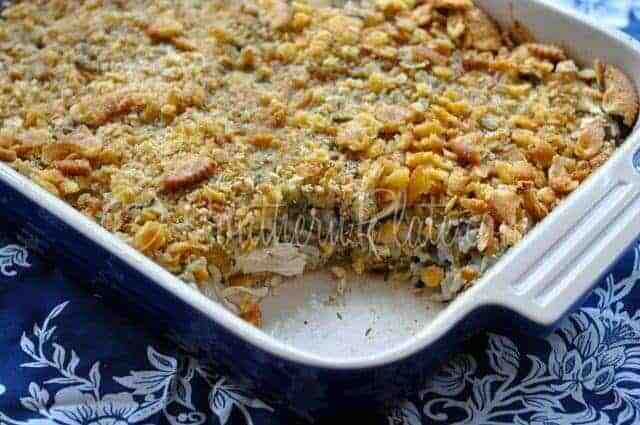 I make a chicken casserole simular to this but in place of ritz cracker topping I use the Pepperidge Farm seasoned stuffing mix.I only use them for things like this so I always have some tightly sealed in a baggie in my cabinet.Gives it much more flavor. 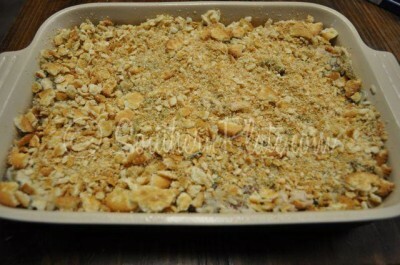 I make a version of this casserole and use water chestnuts, drained and pimentos in it. This is my absolute favorite chicken casserole. Yum! And I will be joining you as another crazy daffodil lady! Always been my fave! Forget roses – give me daffodils! I remember visiting my grandmother on weekends and sneaking over the fence to the cow pasture in the holler (waaaay out in the country of Tennessee) where the daffodils grew wild. I would come back with armloads of them! Mama would put them in vases with a few drops of red food coloring and the next day I had beautiful daffodils with traces of red through the veins and long the tips! Best memory! My husband has planted thousands of daffodils over the years and they bloom from sometime in February through April sometimes. So many varieties and colors that bloom at different intervals keep the yard beautiful almost until the iris open. We even have some pink ones. Love the daffodils and redbud trees blooming at the same time. I’m sure he would be happy to share if you are ever in our neck of the woods. You know that they multiply so well that after awhile you can just divide them and plant some in other spots (or share them with your friends). Christy, I love all your recipes. I too love southern cooking and the simpler the better. I definitely am going to make this dish. Spring is my favorite time of the year and I love the changing from brownish to the bright green of the trees along with the many colorful flowers. Thanks for the recipe. Christy, This is the funniest post you have ever done. I loved it. I read it often, but this one has me laughing out loud. You have no idea how close to home to hit with this one. This recipe sounds so good. I think you’ll make a great daffodil lady. And I would love to come to the cornbread festival. Sounds like maybe a girls upcoming road trip is in our future. I had a few daffodils several years back. My husband had our son out pulling weeds around the front porch and he pulled up my daffodil bulbs. Grrrrr!! So in other words, how do I protect them from the menfolk? I need to plant more this fall. I love them too. You got my vote! And with the drought we’ve had and everything so dead in Texas, we need some FLOWERS blooming! Christy, You have got to stop this going around and spreading “SPRING” fever like this! Don’t you know how contagious it is? Now you’ve gone and infected all the poor folks up North of the Mason Dixon line that won’t see a daffodil until May or later. Have mercy girl!